Jen writes My Little Po-Mo, the TARDIS Eruditorum of ponies. In this scene, Clara is cleverly disguised as a pony named Rose. Consider a fandom. A curious beast, an amorphous, shifting mass of people wrapped around a core of fiction. Despite the variation in cores and size, fandoms all look basically the same. The swarm of flesh devours the core over and over again, yet the core is unharmed. The beast excretes its assumptions and predictions by consensus, layering it around the core like an invert pearl, fanon-grit encrusting a glittering center. Fanficcers and shippers and “expanded universe” authors build their own structures, grit and crystal in varying amounts, arcing off the core. Sometimes these extend all the way out of the beast, where they draw in their own squishy masses of fan; sometimes, rarely, they break off, forming the cores of new beasts, drawing their own paradoxical factions of fans. That is how the beast reproduces; mostly, though, it just grows, feeding on the source work, drawing new fans into itself with reviews and memes and recommendations by slightly pushy friends. But then the beast gets old, and something strange happens: the core cracks. Grit gets inside the pearl. The inmates start running the asylum. This is where things can get weird, when the flow from work to fan ceases to be unidirectional. Which brings us to December 24, 2010. Christmas Eve. As per tradition, tomorrow will be a new Doctor Who special, “The Christmas Carol” to be specific, Matt Smith’s first. Over on American and Canadian televisions, however, the Doctor is showing up in an entirely different, and probably accidental, form. We have, you see, two beasts to consider, and two shows at their core. They have more in common than it seems on the surface, Doctor Who and My Little Pony: Friendship Is Magic. Both are revivals of shows from decades prior. Both were originally educational shows for children, but abandoned that calling early in their runs. Both intentionally build in something “for the dads.” Perhaps most importantly, both reject the ethos of cynicism and violence. And both are cases of the inmates running the asylum. Lauren Faust, the first showrunner of Friendship Is Magic, played with My Little Pony toys as a child. There still exists a drawing she made in her teens which is recognizably one of the characters she would eventually create, Rainbow Dash—her equivalent, perhaps, to Moffat’s Usenet post about us getting the word “doctor” from the Doctor rather than the other way around. So in Doctor Who we have one show that amorphously reaches out and drags other television into itself, absorbing and emboiting it. In Friendship Is Magic we have another show that likes to reach out and point at other television. Inevitably, therefore, their collision occurred entirely by accident and in the imagination of fans. It’s December 24, 2010. Tomorrow, Doctor Who’s latest annual Christmas special, “A Christmas Carol,” airs. Today is another weekly episode of Friendship Is Magic’s first season, “Winter Wrap-Up.” The plot of the episode is not particularly relevant to us; what does matter is that there is a musical number featuring a large crowd singing, and at the 3:32 mark a particular background pony is shown more clearly than at any previous point in the show. His appearance is almost certainly a coincidence. The primary tool used to make the show, Adobe Flash, permits a relatively easy way to generate large numbers of background characters by building a small library of “puppets” with pre-set animations, then duplicating them and adding on different coloration, hair, and so on. This early in the show’s run, the library of additions for the background characters is fairly small; in particular, “cutie marks,”—in the show’s mythology, symbols on a pony’s flanks that indicate their occupation or calling—repeat quite often. One of the most common is an hourglass. So, almost certainly by chance, one of the background ponies—one who has been around since the first episode, actually—is a similar shade of brown to the Tenth Doctor’s coat, has slightly mussed dark hair similar to David Tennant’s, and an hourglass cutie mark. This episode was the first time he was shown prominently enough to be easily spotted without actively looking for him, and so this appears to have been the first time fans noticed and talked about him. Within days, fans had created Doctor Whooves, Last Survivor of Gallopfrey. The usual fanworks followed. Drawings and Photoshopped pictures first, then stories. “Time Lords and Terror” was a particularly influential one; novella-length, it followed the Tenth Doctor as he accidentally slipped between universes, turned into a pony due to “morphic field resonance,” and took on the show’s main characters as companions. The adventure in that one took a typical Doctor Who approach to absorbing other stories, bringing back the villains of 1986’s My Little Pony: The Movie, a trio of witches and an all-devouring goop called the Smooze, as Carrionites in the service of the primordial, Void-dwelling, life-and-matter-hating Lovecraftian entity S’müz. Other fanworks followed. There are fanmade animations, mashups of the Friendship Is Magic theme with the Doctor Who theme, even two entirely independent (other than one crossover) fanmade audio drama series, Doctor Whooves and Assistant and Doctor Whooves Adventures. Some are reasonably good as fanworks go, such as the aforementioned “Time Lords and Terror”; others rather less so (the audio drama crossover has little to no multi-doctor banter and spends much too much time on characters expositing to one another about things the audience already knows). Doctor Whooves and Assistant manages to be interesting fairly consistently, with its serial structure and interesting take on the pseudo-historical: since the history of Friendship Is Magic’s setting, Equestria, is largely unknown, the nearest equivalent, in the sense of being a narrative already familiar to the audience which can be carnivalized by the addition of Doctor Who elements, is aired episodes of Friendship Is Magic itself. Thus we get stories such as the Doctor running around in the background of “Winter Wrap-Up” trying to stop an invasion by alien snow-beasts. There’s also a degree of synergy between elements of the two source texts; while some Doctor Who fans objected to the “power of love” ending to “Closing Time,” dealing with Cyber-Ponies the same way in Doctor Whooves and Assistant makes complete sense, as Friendship Is Magic already established emotions as a source of magical energy. While the level of creative output surrounding Doctor Whooves is, perhaps, unusually high, that it exists is not particularly odd. Fans do strange things, and one of those things is latching onto minor characters and building stories around them. This is neither the first nor last instance of such happening with Friendship Is Magic—indeed, an animation error from the first episode resulted in a walleyed pegasus, dubbed Derpy Hooves by the fans, who dwarfs Doctor Whooves in popularity and serves as the other title character in Doctor Whooves and Assistant. She is actually where this does become unusual, because that first-episode animation error was corrected in subsequent episodes where that particular pegasus appeared—and then, after the online popularity of Derpy Hooves soared, the “error” began being intentionally reproduced in later episodes, leading up to an eventual speaking role. Anthropologist Henry Jenkins has written at length about the ways in which fans repurpose elements of their fandoms’ source texts for use in their own lives, rituals, and creative works. In this sense, though he does not use the analogy, they are much like the Melanesian cargo cults. In the popular understanding, cargo cults imitate Western practices in the hopes of receiving the benefits of Western society; the classic image is of islanders, having seen World War II soldiers receive supplies by air, building a bamboo landing strip in the false hope that this will magically bring back the goods-laden airplanes. This image is quite wrong; cargo cults achieve their actual functions quite well, namely the creation and restoration of social relationships in communities threatened by the pressures of encroaching Western cultures. Similarly, the function of fan activity and fanworks is not (or not merely) to create imitations of the source texts; it is to create, maintain, and renew relationships within a fan community. That fans frequently fail to successfully replicate the properties that make the source text attractive to them in the first place is, to an extent, beside the point. In his Convergence Culture, Jenkins comments on the way in which the Internet and related technology accelerates this process, enabling near-instant fan feedback and thereby permitting a bottom-up response to the traditional top-down flow of media. It is increasingly the norm for any reasonably popular work to accrue its own equivalent to anoraks, an amorphous, communal creature of forum discussions, blogs, fanart and fanfiction. Increasingly, “geek” culture and pop culture are converging, and in the process creating a convergence of the top-down commercial culture with a bottom-up folk culture. And of course, readers of this blog know by now what happens when the top-down meets the bottom-up. At the point of convergence, alchemy occurs. Like the cargo cultists or the alchemists of old, fans below play with the pieces of a work, manipulating them, fermenting and dissolving and recombining them. And the ongoing source texts above, increasingly, respond. As below, so above. 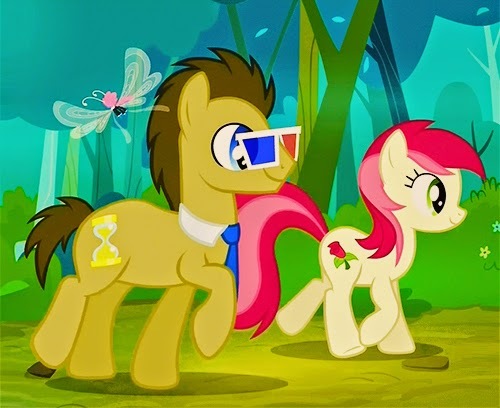 About a year after the fandom first latched onto Doctor Whooves, in the second-season episode “Sweet and Elite” several new background ponies appeared, based on the Third, Fifth, and Eleventh Doctors. What had been accidental was now deliberate. By the fourth season, he has appeared on official merchandise as “Time Turner” or “Dr. Hooves” (the name changes are most likely to forestall potential lawsuits from the BBC), and frequently shows up in the backgrounds of various episodes, often accompanied by the previously established background character Rose. Most blatantly, he appears in the fourth season episode “It Ain’t Easy Being Breezies,” during a sequence involving passing through a rapidly closing portal between worlds, wearing 3D glasses and accompanied by Rose. At this point it is no longer deniable that he is as much a walking Doctor Who reference within the show as in fanworks. There is danger here, as there is with any magic. This kind of direct contact, in which fan preferences directly and immediately influence the source text, does not have a great history where Doctor Who is concerned. Excessive fan involvement in the production of the show contributed heavily to declining quality and eventual cancelation in the 1980s. Doctor Whooves’ presence as a minor background gag is amusing; an entire episode devoted to him would be worrisome. The problem with letting the inmates run the asylum is that most inmates aren’t doctors. But for now, that alchemy has produced the Doctor as a pony, and he in turn has led to the S’müz, cyber-ponies, and reams of fanart, as well as the occasional shout-out in the show. It does not, so far, appear to have caused the collapse and cancelation of either Doctor Who or Friendship Is Magic. So long as those shows remain under the control of skilled creators who know how far to let fan influence in and when to cut it off, this will hopefully continue to remain the case. Wow thanks very much! My mind has been opened. And I really appreciate such an erudite description of alchemy via the image of to the top-down and bottom-up of media meeting. Did Derpy Hooves, like, look at an exploding Rutan spaceship with one eye, and then, later, do it again? 'Cause, that would totally fit. What I'd like to know is where does Charlie the Unicorn fit into the continuity? A good post considering I got a Dr. Whooves foil rare ccg card Monday. Both shows are full of fun and whimsy. The fandoms I am not so fond of. Thanks for lending me your site for the day, Phil! And thanks especially for "the TARDIS Eruditorum of ponies," that's one of the nicest things anyone's ever said to me. Thank you! And you have mostly Phil to thank for that (and jane, too!). I was interested in alchemy before I came here, thanks mostly to Xenosaga and FMA, but didn't realize how widely applicable it could be and how rich in metaphors for, well, almost everything it was until I came here. Makes sense to me. Though it does imply two exploding Rutan spaceships in Equestria. What're they doing there? Why did they come back after blowing up the first time? Or maybe the same spaceship exploded twice. Can you do that? Can you explode twice? Everything bad or weird happens offscreen in Phillydelphia, it's canon. Yeah. I have zero involvement with the Doctor Who fandom, this is pretty much the only Who site I visit with any frequency. But the bronies... my in-person interactions have been with a generally friendly, sweet, open, slightly defensive group of people. But there is SO MUCH toxicity online, and some of it from the same people, it's kind of astounding. I'm guessing I'm probably not the only person who just had to google image search for cyber-ponies. Surprisingly uncute, nasty looking things. Here's a follow-up question, though, because I honestly don't know much about it -- can Jed or someone talk about the phenomenon of bronies? Why did My Little Pony: Friendship is Magic break out amongst male fandom in such a striking way? I find it particularly interesting as an inversion of Doctor Who - a show that used to be dominated by primarily male fans breaking out among female fans with the revival of the show. Are the two doing similar things - blending techniques and stereotypes from both types of stories? I think we mostly agree here that this is a bit of a false dichotomy, but what are DW and MLP doing that they've got it so right? No probs. Love the article. I find it really refreshing reading about a product I have never watched (well until this essay) and have nothing to do with fandom-wise. It feels kinda nice to be on the outside of something like this and get such an interesting perspective on it. Cool. I'm amazed at the existence of all of this, it's like a new world (not tho one I'm going to digest) - which is possibly the same way folk feel when they dip into Doctor Who for the first time. This is a fairly complex question that I address at some length in my book (shameless plug). The short version is a confluence of factors, of which I believe the biggest may be the Internet, which encouraged the growth of bronies in two ways. First, the current generation of young folks overwhelmingly communicates via social media, which is to say networks of connections between friends, and this is their instinctive go-to medium by which to organize for any sort of action. (This has of course always been true, but the Internet has accelerate and broadened these networks, and increased the degree to which individuals are constantly enmeshed within them.) This is a generation whose identity and politics are much more wrapped up in these networks of friends than they are in, say, physical location, industry, family, or arguably even religion. It is thus the first generation which can take a statement like "friendship is magic" seriously, because for this generation it actually is. The second effect of the Internet is the underlying cause behind Rule 34. No matter how unusual and idiosyncratic your interests are, someone on the Internet shares them, and probably has a web forum dedicated to them. So where in the past teen or young adult fans of a "show for girls" would be isolated and subject to peer ridicule,* now they can go online and connect with other fans, which not only reduces the likelihood of them dropping out of the fandom but also gives them a "safe haven" from which to reach out and recruit. The high creative output of the fandom helps here, too--a lot of the bronies I've interviewed for my research first got into the fandom because of fan-created works, mostly videos or songs, and only later started following the show (if at all). The third thing is that the bronies aren't actually all that numerous. The highest-rated episode in the show's run barely passed 750,000 viewers, and that was a season finale and major event episode. Half a million is the general baseline, at least for those episodes for which we have numbers. (They're surprisingly hard to come by, until this most recent season.) What bronies are is extremely enthusiastic, they have an unusually high creative output for the size of the fandom, and also an obnoxious proselytizing streak, all of which combine to make the number of bronies seem larger than it is. Your point about it being an inversion of Doctor Who fandom is interesting. I think you might be on to something that the shows are similar. They're coming at it from opposite directions, but yes, MLP does do that as well, incorporating a lot of elements from the fantasy-adventure genre into its cute-animal-slice-of-life structure. My go-to example here is the first-season episode "Stare Master," which takes a standard sit-com plot of "character with no experience volunteers to babysit, is completely out of their depth" and then takes a sudden third-act turn into fantasy-horror when they start finding the victims of a cockatrice. *Regardless of gender, really. There is a strong and not undeserved stigma against cartoons for girls, due to a combination of sexism and historical factors that meant they were usually of notably lower quality than "general audience" cartoons (i.e., cartoons for boys that girls are grudgingly permitted also to watch). I think there's a regrettable tendency to forget the 20 percent or so of bronies who are women (including among bronies themselves, hence the name). Yeah, I guess that was a book-length question, huh? Thanks for the answer! That babysitting-turned-horror episode sounds awesome.